Bentos #198, 199, 200 and 201! 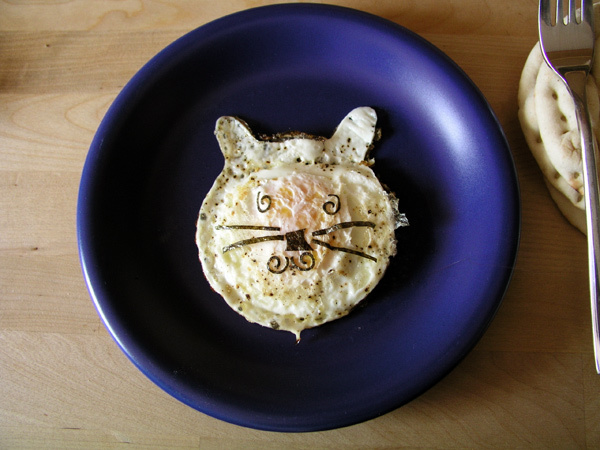 Grr – and I didn’t make a celebratory bento! I’m going to have to do that tomorrow. Since I’m gonna eat bento both morning and evening tomorrow, I made a whopping 4(!) different bentos tonight! Weekend cooking + weekend leftovers make for lots of bento ingredients, luckily. Also for the BF. Halloumi sandwiches with homemade half-wholemeal buns, lettuce, onion and tomato, and a marble box of falafel, croquette balls, brussel sprouts and a cherry tomato. The dog contains Ajvar and mayo. The box is new and has a cute cartoon character on the front, Petterson and Findus (Findus is the cat). There is also a tray that fits in it, but I took it out to fit the sandwiches. My sandwich is accompanied by couscous salad decorated with a tomato and parsley flower, and a fizzy lemon sherbet candy for afterwards. 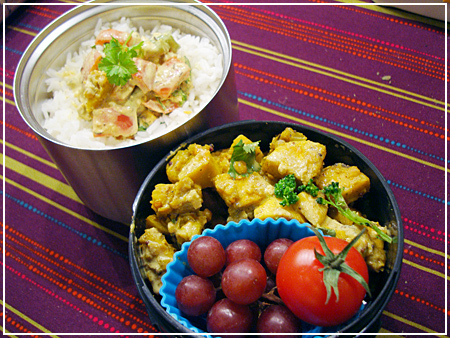 And my lunch menu contains leftovers from the curry cookoff yesterday: Bell pepper curry on rice, and plantain curry with grapes and a cherry tomato in the upper layer. I’ve never had plantains before! They are quite nice – somewhat like potatoes, but without the typical “boiled potato” taste. They smell nicely of banana, too. I used this recipe and I heartily recommend it! So much for my cooking adventures this week! How about you? 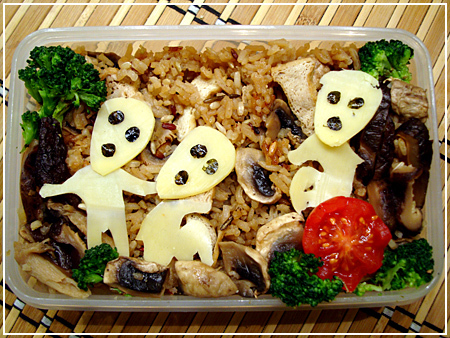 What a monday bento. 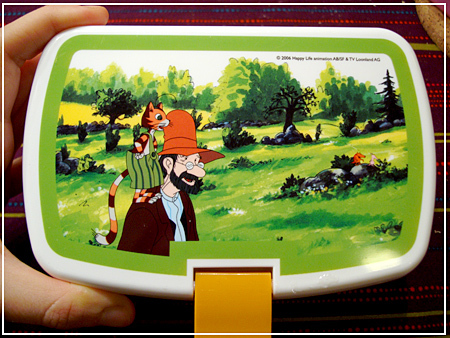 I’m sure everyone has some of those days… but I needed a bento, I have meetings straight through lunchtime today! I came home late from Aikido training last night and was glad I already had vegetable curry and some Naan dough leftover from lunch. Make space in the box, add some microwave-cooked rice and pea greens, and off we go. 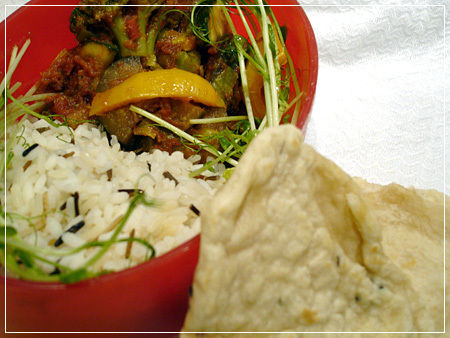 The Naan is quickly fried up into bento-sized portions in a pan. 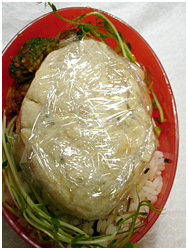 Here’s the bread wrapped in plastic foil so it won’t get soggy until lunch. If there’s one thing I can’t stand, it’s soggy food… Eugh. I must have suffered from how-hard-can-it-be-itis this weekend, because I did not only make Naan, I also made tortillas on saturday! Mmm, flatbread weekend. I will have to tweak my recipes somewhat still (the Indian restaurant cookbook’s Naan method did not quite win my heart) but I dare say it was successful anyway if it got me over another baking hurdle! I seem to be on a vegan roll with my lunchboxes this week…! 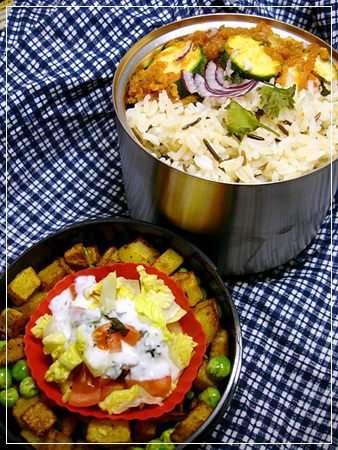 The big container holds 1/3 spiced mixed rices (black longgrain, parboiled, red, white roundgrain, brown roundgrain), 1/3 red lentils boiled with turmeric and raisins, and 1/3 palak paneer tofu – spinach curry with tofu and green peppers. You can’t get paneer here and I’ve not attempted to make it myself yet, so I replaced it with tofu. Works ok, I guess, though it should have simmered longer to make the tofu take up more of the curry’s taste and saltiness. The small container holds candy easter eggs (of questionable vegan status), lettuce, sugar snap peas, red pepper strips and a baby plum tomato. The recipe for the curry is again adapted from The Indian Restaurant Cookbook – it had no proper palak paneer recipe but I adapted its spinach curry for it. 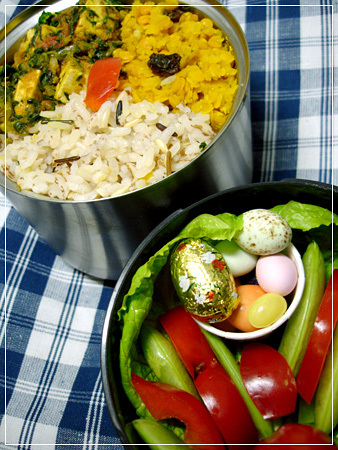 Thermos container holds rice (half jasmine, half a parboiled/black longgrain mix) and veggie curry with red onion, bell pepper, cauliflower and zucchini. Decoration is onion and coriander. 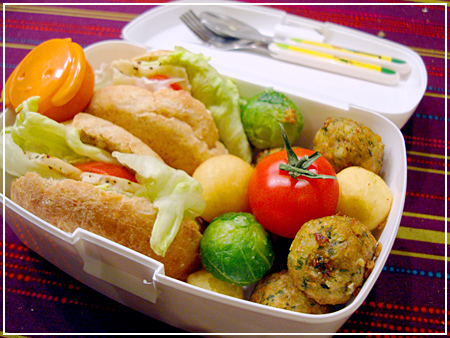 The side box holds a silicone muffin cup with a salad heart and tomato cubes in yoghurt dressing, and curry fried potato cubes with peas. All the recipes in this box are from Pat Chapman’s The Modern Indian Restaurant Cookbook, which was my Christmas present from a British friend. I can’t say that I have mastered curry yet, but thanks to the book it’s definitely getting better! It’s not a vegetarian book, but still a very good reference and contains all the basics you need to know about curry cooking. Very recommendable! 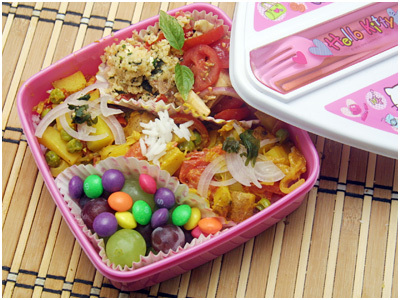 I love curry and it makes great lunchboxes, but I always find it looks untidy and not very presentable. 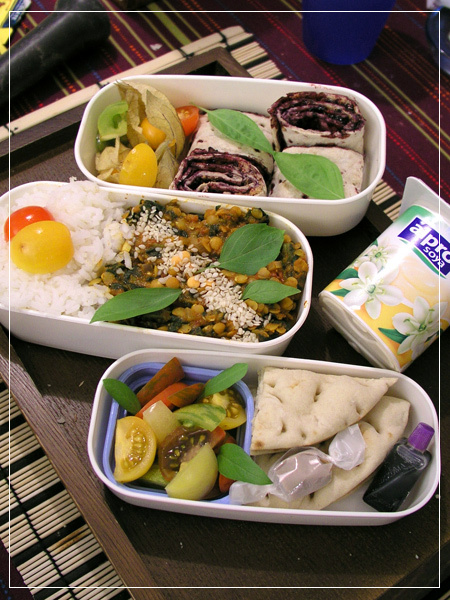 It’s annoying actually – therefore I challenge YOU to make a tidy-looking Indian curry bento! There won’t be any prizes, but it’ll satisfy my curiosity, and I will of course link to any interesting bentos/tiffins that you link me! 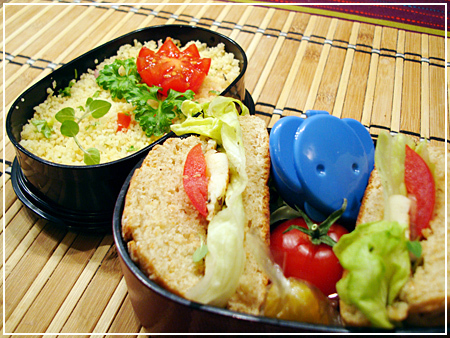 Top: Tabbouleh and caprese salad in a muffin cup, basil leaves. Middle: Indian potato, pea and tomato curry on a bed of rice. Bottom: Blue and green grapes and sour skittles! And because I’m a good girl and know my foodgroups, there is also milk and chocolate banana Pocky hidden under the fork in the lid. Help is very, very appreciated. Also, is there anywhere I can get Ghee in a non-metal container smaller than 1 litre? On the plus side, yay for weekend shopping and coming home with fresh supplies of British and Asian candy! Breakfast (top): Physalis, pb/blueberry rolls (which got messy when I cut them), tomato slices, basil leaves. And a vanilla soyghurt. Lunch 1 (middle): Rice with more tomato, dahl spinach with sesame deco. I can’t seem to get the taste right. I must be using the wrong curry or spices. Also, all recipes say to add tomato but it always tastes way too tomatoey for me. Lunch 2 (bottom): Colorful wild tomato wedges with basil leaves and a bottle of dressing; bread to go with the curry; a coffee sweet. 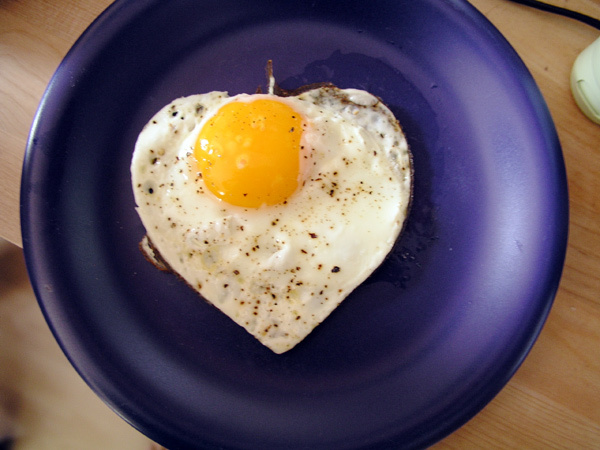 Also, I saw those cute little egg/pancake shapes in an advertisement and my grandma sent me some! The only problem is that they are way too big for my bento boxes. Now I’m conspiring on what other boxes to use so I can show them off! The recipe for the Dahl Spinach was found online, but doesn’t seem to work quite as I want it yet. Generally, red lentils seem to work very nicely for me because they don’t need excessive soaking to be ready to cook and eat. I was recommended to let them soak for an hour before eating but I think that with this type of broiling the soaking time can easily be reduced further. They are also filling and tasty, but not mushy – an excellent compromise between my vegetarian protein quandary and my BF’s hatred of mushy bean-type veggies. 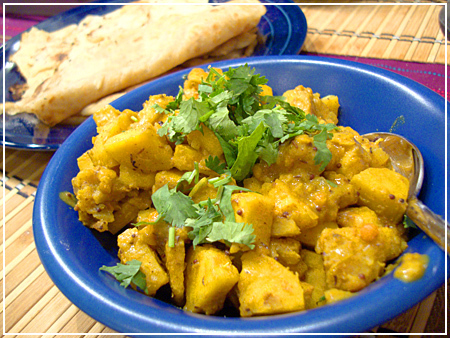 One of the clues to getting the taste right, besides the obvious “choose the right curry”, seems to be to use Ghee – cleared butter fat which gives Indian food a distinctive taste. After melting the butter, the spices should be added successively to give taste to the sauce and vegetables as they fry. Another idea is to add turmeric and chili to the cooking water of the lentils so they already get a spicy taste before they are mixed in with the stirfry. * Bottom tier: Chèvre (soft goat cheese), dried fruit and prunes, crackers, and a plum.